The present El Niño event, on the cusp of attaining “strong” intensity, has a chance to become the most powerful on record. The event — defined by the expanding, deepening pool of warmer-than-normal ocean water in the tropical Pacific — has steadily grown stronger since the spring. The presence of a strong El Niño almost ensures that 2015 will become the warmest on record for Earth & will have ripple effects on weather patterns all over the world. A strong El Niño event would likely lead to enhanced rainfall in California this fall & winter, a quieter than normal Atlantic hurricane season, a warmer than normal winter over large parts of the U.S., & a very active hurricane & typhoon season in the Pacific. Some of these El Niño-related effects have already manifested themselves &, over the U.S., will become particularly apparent by the fall & winter. Frequent & persistent bursts of wind from the west, counter to the prevailing easterly direction, have helped this year’s El Niño sustain itself & grow. Warm water from the western Pacific has sloshed eastward, piling up in the central & eastern part of the basin. The sprawling area of warm waters has proven to be a boon for Pacific tropical cyclone activity, near record levels through mid-summer. Through a positive feedback mechanism, these cyclones have likely helped to reinforce the westerly push of warm waters, Slate’s Eric Holthaus reported. 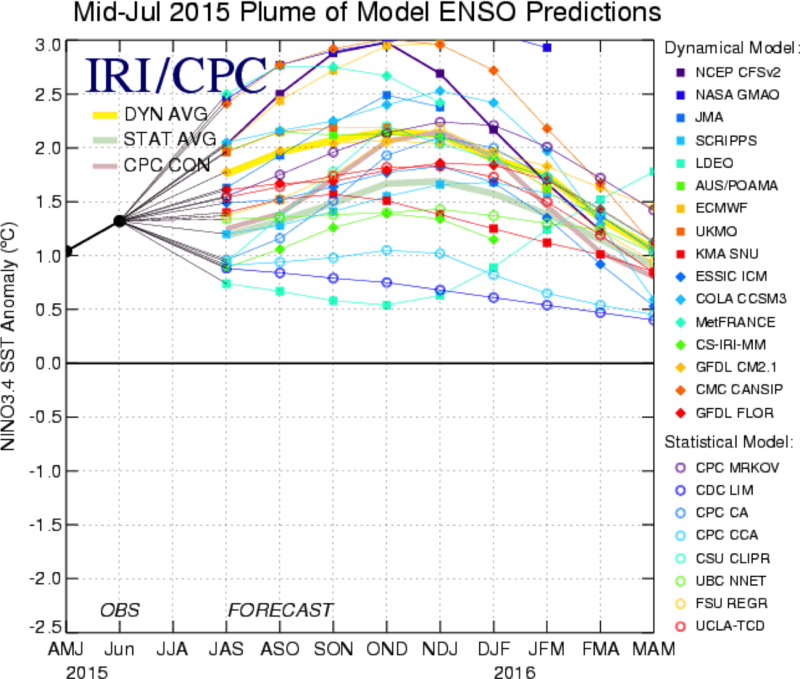 The 2015 El Niño event is now neck-&-neck w/record-setting event of 1997-1998 in terms of its mid-summer intensity. That 1997-1998 event was notorious for its winter flash floods & mudslides in California. Although the El Niño is still officially classified as a “moderate” strength event, Tony Barnston, 1 of the world’s leading El Niño experts, explained it could well become a “strong” event by the end of the month. A few models, notably the European model & the National Weather Service CFS model, point to the possibility of a near-record event in which a very strong or “super” El Niño develops. 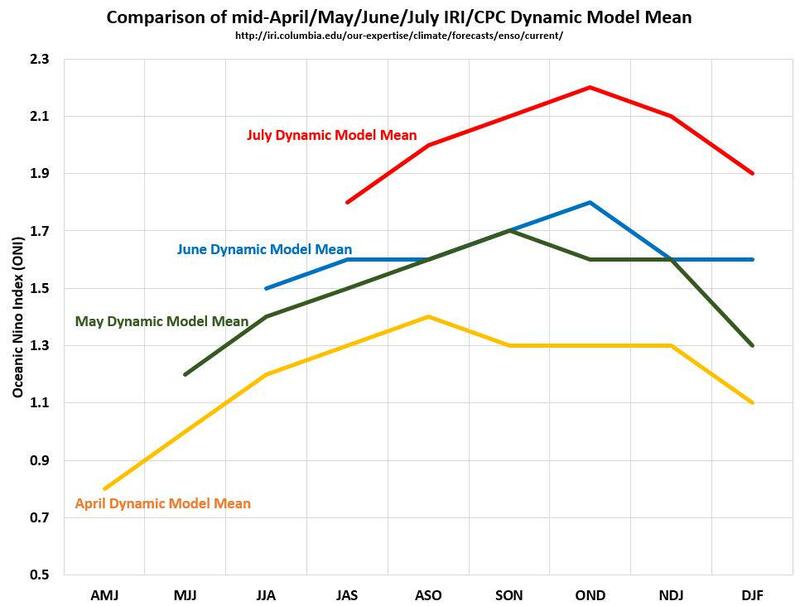 While some models show El Niño possibly maxing out in record territory, NOAA climate analyst Michelle L’Heureux expressed some skepticism about such projections in an interview w/Mashable’s Andrew Freedman. “L’Heureux noted that none of the major forecasting centers responsible for monitoring El Nino are predicting a record event at this time,” Freedman reported. NOAA says the “forecaster consensus” is for a strong event but doesn’t specify how strong. 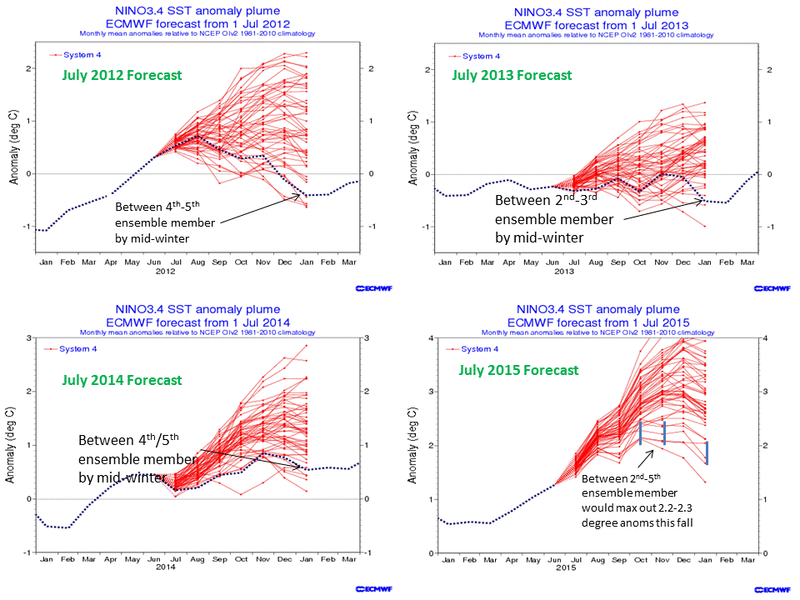 Its forecast calls for El Niño to persist through the winter (90% chance) & early spring (80% chance).